Amireia 200 S is an extruded version of cattle urea, which has slow degradation and 200% crude protein. A complete protein additive, efficient and economical, which meets the requirements of large makers and farmers at a worldwide level. - Slow Degradation - Degradation for 12 hours in the rumen ensures higher rates of microbial growth due to the perfect timing of the readily available energy (Extruded Starch) with a slow release of Nitrogen and Sulfur. - Reduce Cost - Amireia 200S is ideal for replacing protein meal, as it reduces the final cost of protein, feed and protein salts. - Sustainable - Amireia 200 S is better used to Ruminal Flora for the production of microbial protein, which considerably reduces the concentration of Ammonia or Urea in the urine, minimizing the contamination of the soil/environment. 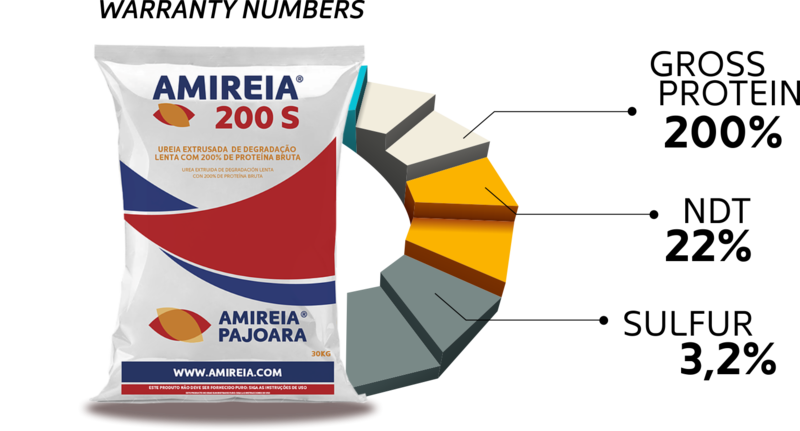 - More Profit - Amireia 200 S allows to replace up to 50% of the protein soybean meal in the dairy cattle feed, lowering the cost of feed production without any change in the production and quality of the milk.